Rendering In SketchUp provides instructions for creating 3D photoreal graphics for SketchUp models using integrated rendering programs. The book serves as a beginner rendering manual and reference guide to further develop rendering skills. With an emphasis on step-by-step process, SketchUp users learn a universal approach to rendering varied SketchUp projects, including architecture, interiors, and site design models. Exterior and simulated lighting: Learn to set exterior lighting with the SketchUp’s Shadow menu or illuminate a scene with simulated lights, lamps, and bulbs. Render settings: Use specific settings for various rendering programs to quickly set texture character, image quality, and graphic output. Computer specifications: Find out how computers produce renders and the type of computer hardware required to streamline the process. Photoshop post-processing: Learn how to further refine rendered images in Photoshop. 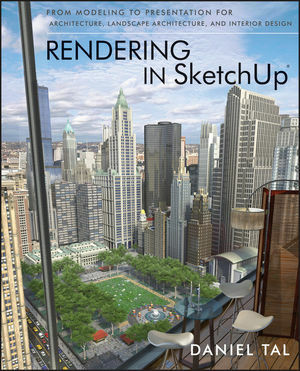 **Free online chapters: The book reviews specific settings for SketchUp and the rendering plug-in Shaderlight. Given the ever-changing nature of technology, free, online accompanying chapters detail settings for additional integrated rendering programs including SU Podium, Twilight Render, and more.